There are many wonderful Western Caribbean cruises to choose from, no matter what part of the country you live in. It is important when planning these Western Caribbean cruises that you try to plan ahead, and shop around for the best prices. Here we have compiled a list of the top 5 cheap Western Caribbean cruises. 1. 6 Night Western Caribbean Cruise by Royal Caribbean International – Guests will leave Ft. Lauderdale, FL and visit Georgetown, Grand Cayman Islands, Falmouth, Jamaica and Labadee, Haiti. For only $369 per person this is a great way to enjoy a cruise to Jamaica from Florida. 2. 7 Night Western Caribbean Cruise by Norwegian Cruise Lines – For about $379 per person, guests will depart from Tampa, Florida before sailing to ports such as Roatan, Honduras, Belize, Costa, Maya, Mexico and Cozumel, Mexico. 3. 4 Night Western Caribbean Cruise by Royal Caribbean International – Guests will enjoy this short cruise for only $309 per person making this one of the least expensive Western Caribbean cruises. The ship will depart from New Orleans, LA and stop in Cozumel, Mexico making this one of the best ways to cruise to Cozumel, Mexico. 4. 6 Night Western Caribbean Cruise by Carnival Cruises – This is one of the least expensive Carnival Western Caribbean cruise deals at only $329 per person. The ship will depart from Ft. Lauderdale, FL before heading to the ports of Key West, FL, Georgetown, Grand Cayman Islands and Ocho Rios, Jamaica. 5. 7 Night Western Caribbean Cruise by Princess Cruise Lines – For about $599 per person, guests will enjoy many ports of call such as Georgetown, Grand Cayman Islands, Roatan, Honduras, Costa Maya, Mexico and Cozumel, Mexico. This is a wonderful way to enjoy a Cayman Islands cruise. 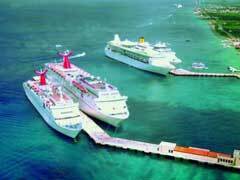 When you choose one of these wonderful Caribbean cruises, it is best to plan as far in advance as possible so as to get the very best Western Caribbean cruises deals that are available.